Private collection, Paris (by 1927). Paul Cassirer, Berlin (circa 1927). By descent from the above to the late owner. L. Venturi, Cézanne, Son art, son oeuvre, Paris, 1936, vol. I, p. 270, no. 1050 (illustrated, vol. II, pl. 308; titled La Carrière de Bibémus). J. Rewald, Paul Cézanne, The Watercolors, A Catalogue Raisonné, Boston, 1983, p. 196, no. 441 (illustrated). Berlin, Galerie Alfred Flechtheim, Cézanne Aquarelle und Zeichnungen, Bronzen von Edgar Degas, 1927, no. 30. Providence, Rhode Island School of Design, 1935. Omaha, Nebraska, Joslyn Memorial Museum, 1941. Washington, D. C., The Phillips Collection; The Art Institute of Chicago and Boston, Museum of Fine Arts, Cézanne, An Exhibition in Honor of the Fiftieth Anniversary of The Phillips Collection, February-July 1971, p. 83, no. 48 (illustrated). Kunsthalle Tübingen and Kunsthaus Zürich, Cézanne Aquarelle, January-May 1982, no. 62 (illustrated). Between 1895 and 1899 Cézanne rented a stone cabin near Bibémus, an abandoned quarry approximately three miles east of Aix-en-Provence. Here he found the motif to which he returned time after time in his late watercolors: the soaring vertical pine trees set in counter-point against the softer, rounded shapes of rock formations. 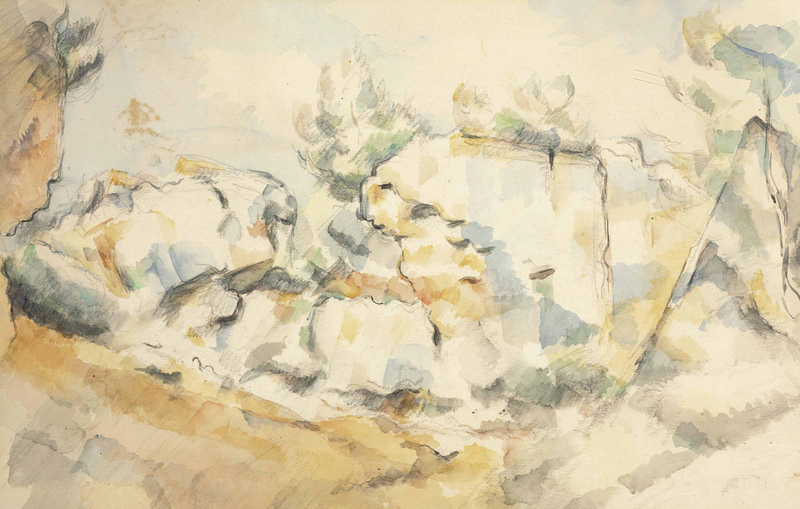 The Bibémus quarry was a principal site of Cézanne's work at the end of his life, and, like Mont Sainte-Victoire, is among the key motifs of his late pictures. The present watercolor, with its vibrant blue, green and ochre brushstrokes, and its powerful overall rhythm, is an outstanding example of the artist's late style. Cézanne's taste for woods and underbrush as a principal motif emerged during the 1870s, a key period in his artistic development. At this time, Cézanne was working at Pontoise and Auvers alongside Camille Pissarro, whose luminous palette and patient observation of nature were critical influences on the younger painter. In later years, Cézanne described his Impressionist mentor with gratitude and affection as "the humble and colossal Pissarro," and recalled, "Old Pissarro was a father to me; someone to turn to for advice, somebody like the good Lord Himself" (quoted in B.E. White, Impressionists Side by Side, New York, 1996, p. 109). The radiance of the present work reflects Cézanne's deep connection with Provence. Cézanne and Emile Zola had roamed this section of the countryside as children, and in later life he still felt a great attachment to the area. To Joachim Gasquet, he wrote of "the links which bind me to this old native soil" and admitted, "Were it not that I am deeply in love with the landscape of my country, I should not be here" (quoted in Cézanne, The Late Work, exh. cat., The Museum of Modern Art, New York, 1977, p. 26). The luminosity of the present view recalls Cézanne's description of his native land as "so vibrant, so austere, reflecting the light so that one screws up one's eyes, and mesmerizing the receptacle of our sensations" (quoted in Cézanne in Provence, exh. cat., National Gallery of Art, Washington, D.C., 2006, p. 4). Philip Conisbee has concluded, "Provence was Cézanne's country: he was at home there as nowhere else. His sense of being grounded in so particular and so familiar a place, resonant with memory and emotion, caused him to concentrate much of his extraordinary pictorial intelligence there and to create from that landscape some of the most remarkable and original images in late nineteenth- and early twentieth-century art. There is a powerful sense of place in Cézanne's Provenal paintings--above all in the Pays d'Aix, around Aix-en-Provence. This was the country of his affective bond" (quoted in ibid., p. 1). This season, Christie's is honored to offer works from the estate of J. Carter Brown, the long-time director of The National Gallery in Washington, D.C. Educated at Harvard College, Harvard Business School and New York University, where he received his MFA, Brown joined the National Gallery as then-director John Walkers assistant. At age 34, he ascended to the directorship, leading the institution for 23 years (1969-1992). Under his tenure, he added significantly to the museums permanent collection, accessioning such masterpieces as Cézanne's "Boy in a Red Vest," and presided over the design and creation of I.M. Pei's East Wing. His leadership is perhaps best known for the blockbuster exhibitions he brokered, bringing such celebrated shows as "Treasures of Tutankhamun" and "Treasure Houses of Britain" to the nation's capital. We are pleased to offer works by Cézanne, Kolbe and Picasso from Browns estate in the Impressionist & Modern Works on Paper and Day Sales.